Last time we talked to you about the Ratcatcher’s Guild we looked at the final two Ratcatchers to be revealed, Squeak and Miasma. If you missed that blog you can find it HERE. Bonesaw's use in the Ratcatcher's Guild should be immediately obvious. He's a striker, the Ratcatchers like scoring goals, in the historic words of Avril Lavigne, could I make it any more obvious? Bonesaw brings a model who can score goals without the need for quite as much of the usual Ratcatcher nonsense as most of their models do. He's the only model the Ratcatchers have access to which has a KICK distance of longer than 6", and that's something worth bearing in mind if your opponent is using a goalkeeper with Rush Keeper, or Horrific Odour, or just any rule that makes positioning for Shots more difficult. That extra 2" of KICK distance gives you a lot of flexibility to get around those nasty goalkeeping tricks. 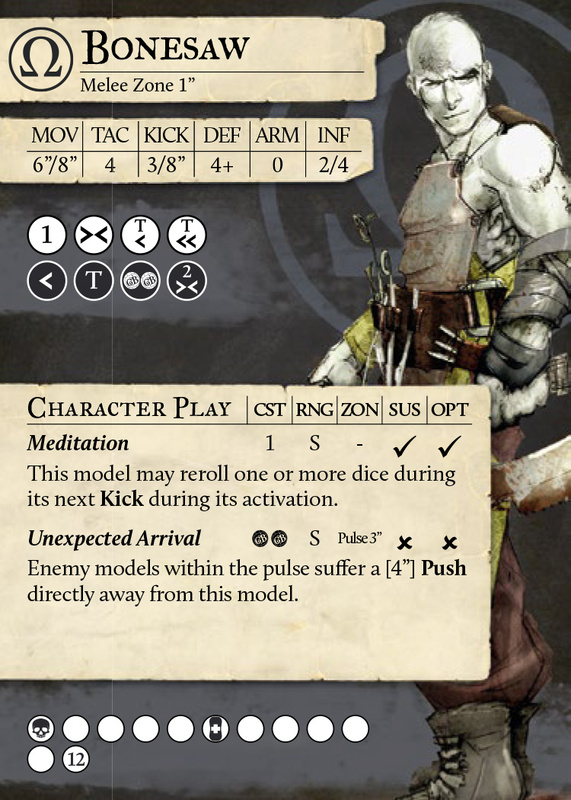 Bonesaw is also a model that likes having other models with good KICK values around, and fully half of the Ratcatchers have a 3 dice kick, allowing him to more reliably use Football Dervish to go for those enormous mazy goal runs he's such a fan of. One particular synergy worth mentioning is Piper's Reverie ability. The menagerie of uses this can be put to on Bonesaw is enormous, allowing him to move to a position to chase the ball, or even the very simple one of, Piper gets the ball, passes to Bonesaw, who Dodges 4", then Piper Reveries Bonesaw to Sprint 8", then he can take a Shot from 8" away. Coaches often talk about a player's threat range on goal in their own activation, well there we have a 20" goal threat in someone else's activation! And the best bit? Bonesaw can then Dodge and be sitting right in front of the enemy goal with 4 Influence, waiting to see where the ball gets kicked out! The opposing player has one activation to hide the ball away or Bonesaw's just gonna come over there, snaffle the ball, and either put it somewhere he can get it next turn, or maybe even go for another goal himself then and there! Piper and Bonesaw really are bosom buddies, especially since Bonesaw gains +1 DEF as soon as he scores a goal. Piper makes that waaaaay easier for him, meaning Bonesaw becomes potentially the third DEF 5+ model on the Ratcatcher team (with Piper and Pelage), which can be enormously frustrating for the opponent to deal with. And we haven't even mentioned Bonesaw's Unexpected Arrival Character Play feeding into all of the movement nonsense that Ratcatchers can pull anyway! The Man Who's Honestly A Bit Too Keen on Rats, I Mean Seriously.. Whereas Bonesaw brings a dedicated striker to the Ratcatchers, Veteran Graves brings a more flexible support/beatdown model. He brings a 2" melee zone, which is of course always good, meaning the Ratcatchers can run a team with four 2" melee models (Skulk, Graves, Scourge, Miasma), giving them a lot of options in that regard. Graves can knock down and put bleed on enemy models, which is always useful, but especially useful in the Ratcatcher's Guild where the disease condition makes it SO much more of a pain for the enemy team to remove conditions. Any additional conditions the Ratcatchers can bring on top of that have their effect multiplied, making it much more frustrating for the opponent. Graves also actually allows the Ratcatchers to do something few other Guild can do, his Gravedigger Character Play in combination with Scourge's Snack Break can let the Ratcatchers get a take out worth 4 VPs. The Snackdigger (Gravebreaker?) combo is just flat out 4 VPs from a take out, thank you and goodnight. It also opens up the option for a three take out victory, if you achieve that three times. It won't be easy, but imagine if you pull it off? You'd be a hero, nay, a legend from a more mythic time. That dream aside, just getting 4 VPs from a takeout is enormous, or two which are worth 3 VPs each. It can't be understated how powerful this ability is. Having two separate options for gaining additional VPs makes your opponent's life that much more difficult, since they have to consider so many more threat vectors and options you have available. Playing against the Ratcatchers can be a real mental challenge, and Graves amplifies that! The final thing Graves brings to the table is the back of his card. He works very well with Squeak, allowing the biggest ratty boy himself to gain +1 DMG, which is always useful, or Graves can bring Squeak back if he gets taken out early AND Squeak will still have any Influence he was allocated at the start of the turn. 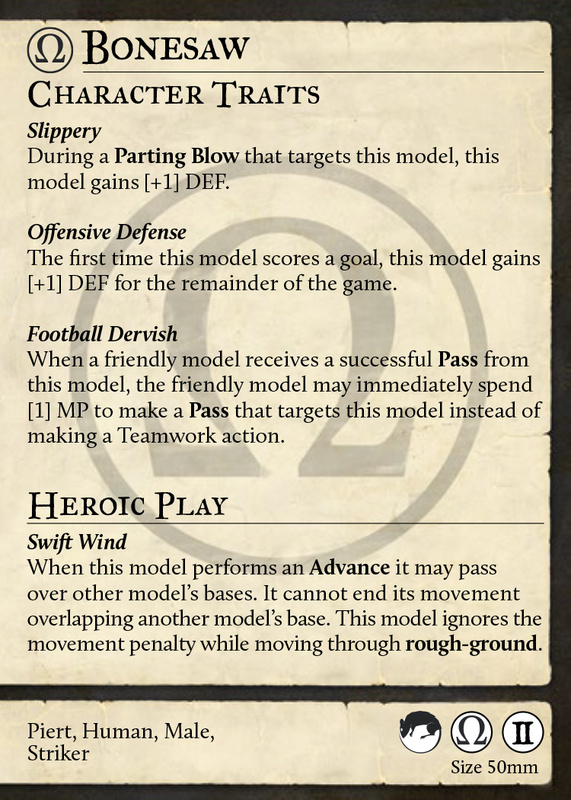 Activation advantage is a huge thing in Guild Ball, and if Squeak gets taken out before he can activate, while that may not be a huge deal in terms of what you're hoping to achieve, giving up an activation can mean your opponent gets the last activation or maybe even the last two, which can be pretty crippling. This is especially true since Squeak rather likes being in the middle of things so he can use Dreadful Shriek to best effect. Graves being able to bring back Squeak with Creation so that the activation isn't lost can really mess with what your opponent was hoping to achieve this turn, and force them to take more time thinking through their plans. So there we have it, the two Mortician players who can also play for the Ratcatchers. They're an odd, fearsome pair, the fallen priest and the melancholic ratsman, perfectly able to synergise with whatever style of Ratcatcher team you want to build.